The Mahindra Marazzo is a practical, spacious, budget-oriented MPV that is sure to give its competitors a run for their money. 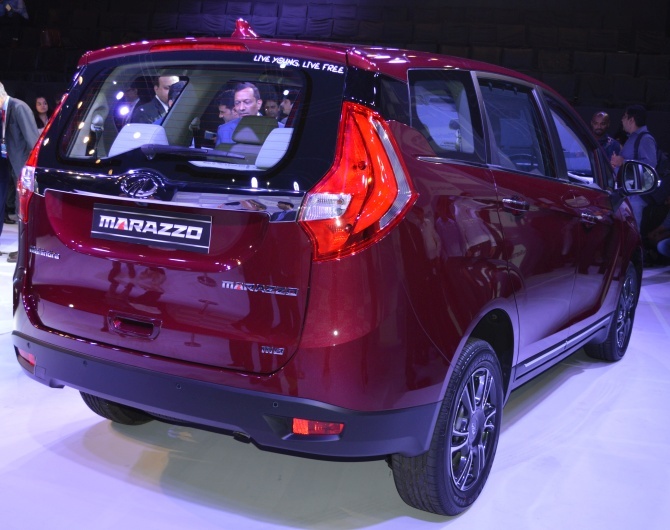 Rajesh Alva/Rediff.com reveals the good, bad and ugly of the latest MPV from the Mahindra stable. Mahindra's latest offering, the multi purpose vehicle Marazzo, will be competing with segment leader Toyota Innova Crysta, Tata Hexa, Renault Lodgy, Honda BR-V and current favorite Maruti Suzuki Ertiga. With the launch, Mahindra is clearly aiming to set itself up in this segment. Derived from the Basque word 'Marazzo', which means a shark, the vehicle is clearly influenced by the physical aspects of a shark. If you didn't get the point, its latest TVC drives home the point further. The Marazzo carries a new bold design, which Mahindra is using for its new generation vehicles. 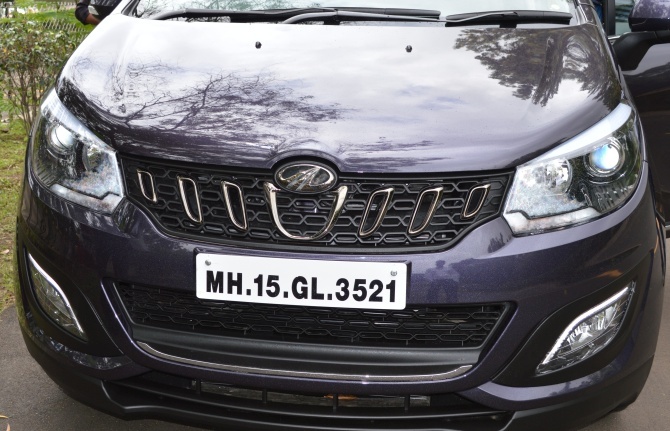 Mahindra claims the front grille inserts looks similar to shark teeth and the tail lamp is inspired by the shark-fin. Undeniably, this adds to the vehicle's aggressive looks. The Marazzo is developed by a collaboration between Mahindra Automotive North America and Mahindra Research Valley, Chennai, while the design element is an outcome of collaboration between Pininfarina, Italy, and Mahindra Design Studio in Mumbai. For now at least, the Marazzo has been launched only with the diesel option with manual gearbox. 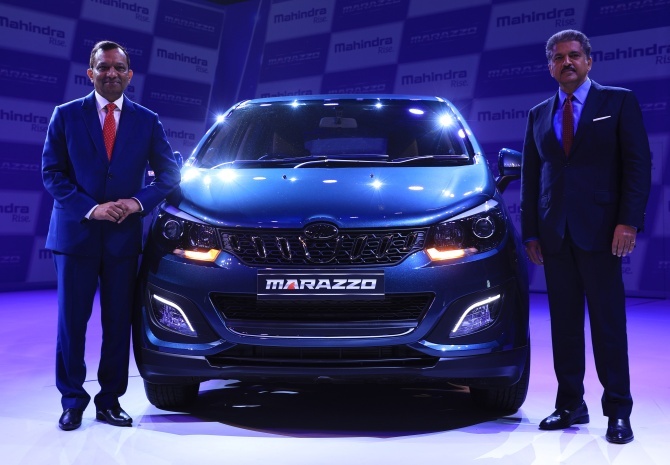 Pawan Goenka (managing director, Mahindra & Mahindra) during the launch stated that the company has plans to introduce a petrol engine for the Marazzo only in 2020, once the BS-VI emission norms kick in. Mahindra also has plans to roll out an automatic variant in the near future. 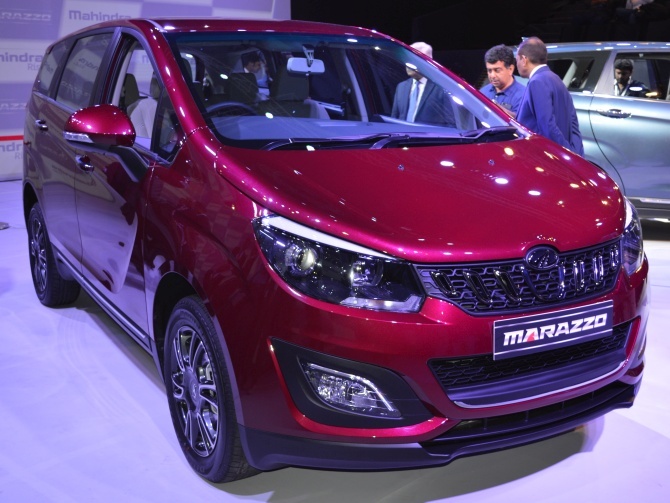 The Marazzo has a body-on-frame structure with front wheel drive, which results in light weight, a car-like handling, and also the durability and toughness of monocoque chassis. Despite getting a body-on-frame structure, the vehicle has a low-floored cabin. The Marazzo will come in 7-seater and 8-seater options, with the 7-seater offering captain seats in the 2nd row. The 2nd row (in 8-seater) and 3rd row come with a foldable 60:40 split (mouse-over the above image). 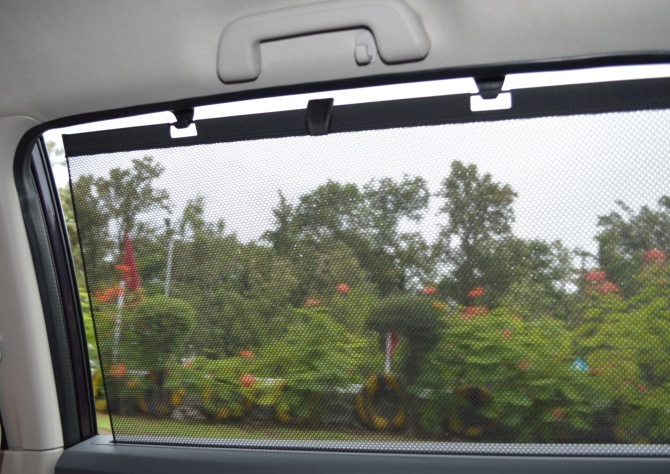 There is also a pull-up sunshade for 2nd row passengers. The Marazzo gets a three-box design with as forward as possible A-pillar to maximise interior space. Compared to the body, the headlight is bit small for my liking while the tail light is a bit too big. As you get inside the cabin you will get that airy feeling due to the large windscreen and massive windows. 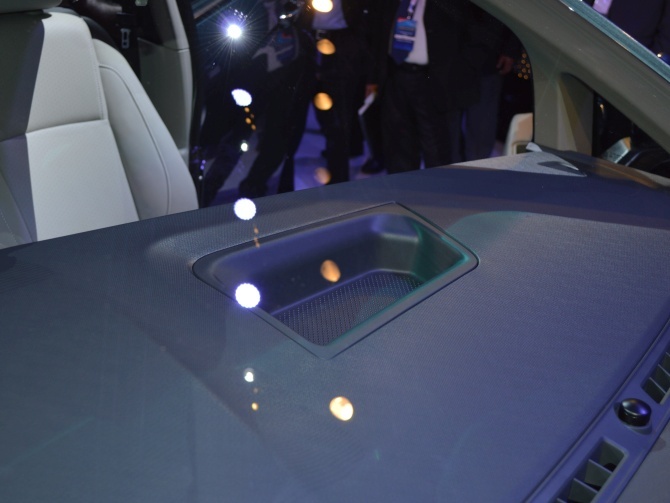 The Marazzo comes with a roof mounted air-con system for second and third row passengers. 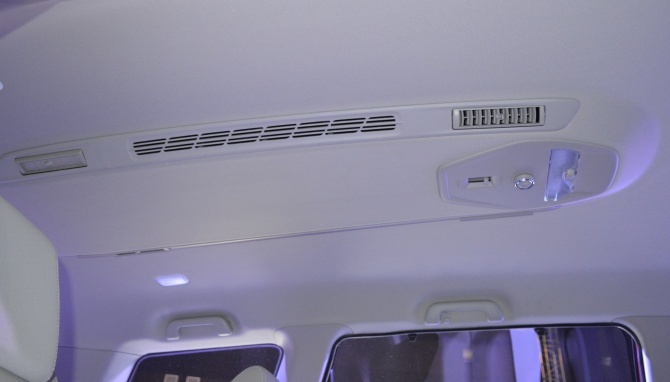 Mahindra claims the rear roof mounted AC helps cool the cabin quicker than the rear floor mounted AC unit. But the presence of roof mounted AC means there is no option for a sunroof. 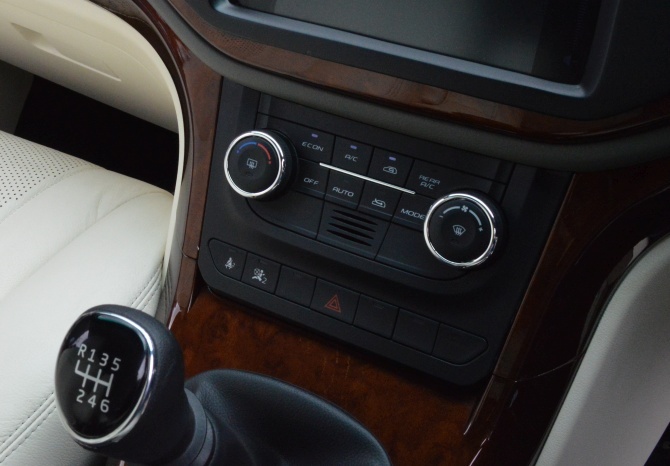 The dashboard gets a large 7-inch colour touchscreen infotainment system with reverse parking camera that shows guidelines and also helps you with audio-visual guidance. There is also a multi-information display and analogue dials with purple background. 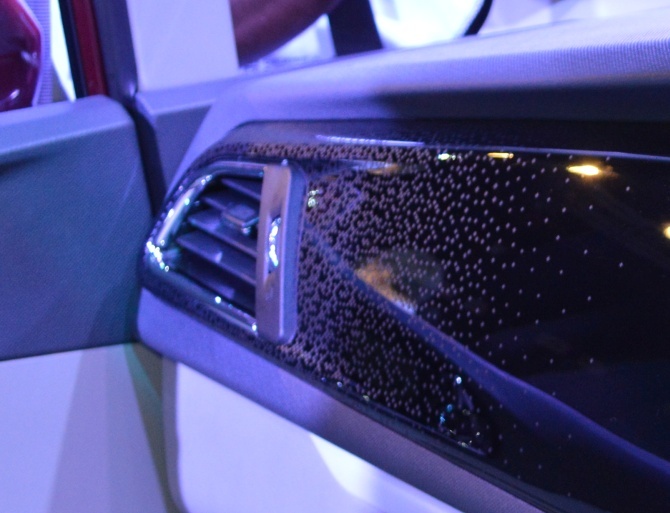 The piano black finish dashboard with chrome-finished air-con vents gives the Marazzo a premium touch but the white dots on the left side of the dash look very odd. 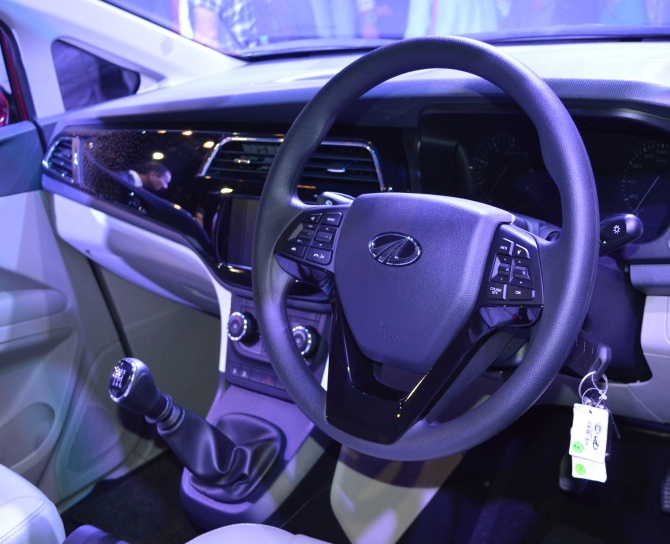 The dashboard offers iPod connectivity, on-board navigation, Android auto, automatic climate control, steering mounted controls and first-in-segment emergency call feature using Mahindra Blue sense app. Sadly, Apple Carplay has been left out. The Marazzo has also missed out on keyless entry and push button start. The quality of plastic and fit-finish has really improved, compared to earlier siblings. Many interior parts are similar to other Mahindra cars. 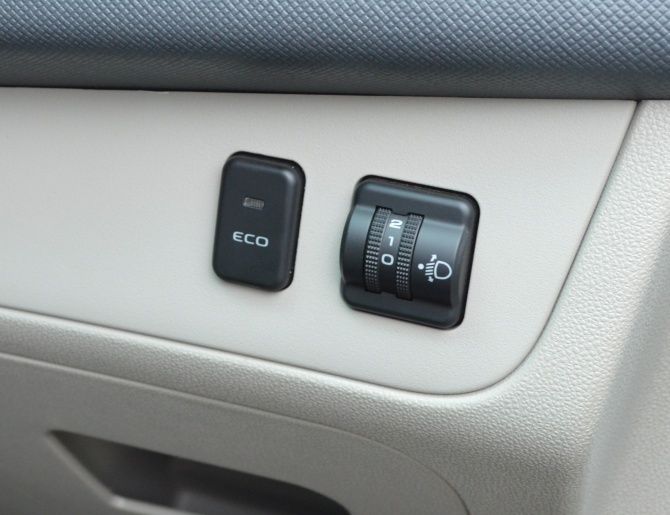 Like, the climate control unit is taken from the XUV 500. The Marazzo is a practical car with plenty of storage but some features are difficult to access. 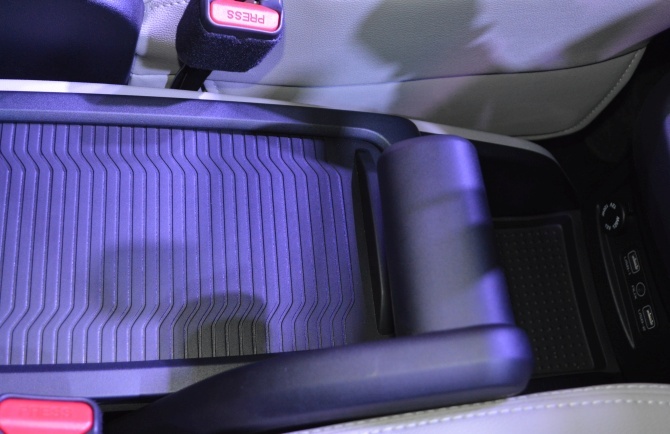 The handbrake design is similar to that of an aircraft, but difficult to operate compared to our conventional handbrakes, and also occupies more space. The box on top of the dashboard where we normally keep the phone, toll tickets and sundries is way behind. The USB charging point is also deep down and difficult to reach. The seats, however, are very comfortable and offer good under-thigh support for long journey, and they look very premium too. The legroom and headroom are quite good for first two rows, whereas legroom is a bit of an issue in the third row. Adults will find their legs sticking to the back of the second row seat. The third row space is almost similar to the Innova but looks more spacious due to the large windows. 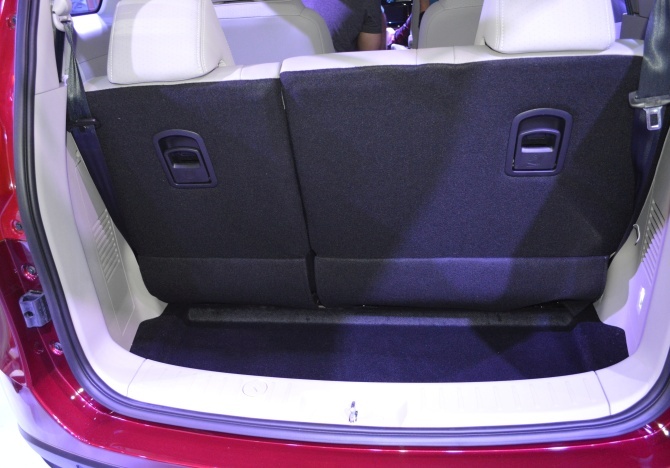 The boot capacity is 190 litres compared to 300 litres of the Toyota Innova. With the third row folded, it goes up to 680 litres, and to a massive 1,055 litres with the second row also down. Sadly, the seats do not fold flat down (mouse-over the above image). The Marazzo debuts with an all-new engine. According to Mahindra, a lot of aluminum has been used in the engine to keep the weight down. The engine is placed in a transverse (east-west) position instead of north-south, which opens up a lot of space for the cabin. But this makes it difficult to access the battery as it is placed behind the engine. Power is generated by 1.5 litre, 4-cylinder D15 diesel engine which produces 90.2kW (121 HP) power and 300 Nm torque. Crank the engine and you can hardly feel any vibration in the cabin. The torque kicks in pretty early, at 1500 rpm. The NVH (noise, vibration, and harshness) levels are well refined when compared with other Mahindra vehicles. Power delivery is very linear. It has a strong mid-range but top-end power struggles as it makes hardly any progress beyond 4000 RPM. However, the engine has enough punch for sensible driving. 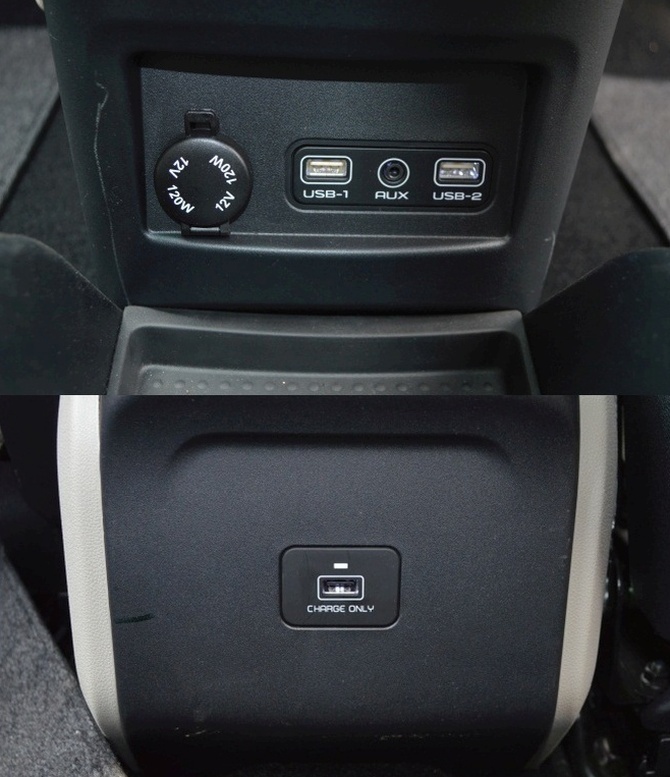 There is also an option of ECO mode on selecting which the power output drops to 100 HP for better fuel efficiency. The ARAI-certified mileage for the Marazzo is 17.3 kmpl. The Marazzo comes with a 6-speed manual gearbox. Gear shifts are nice and smooth and the clutch feels very light, making it very easy to drive. High-speed stability is also good and the steering wheel gives a nice feedback even at high speeds. But you will find some body roll at high speed curves. The Marazzo is offered in 4 variants -- M2, M4, M6, M8 -- and six colour options: Mariner Maroon, Poseidon Purple, Aqua Marine, Iceberg White, Oceanic Black and Shimmering Silver. On the safety front, the Marazzo comes with dual airbags and ABS (anti-lock braking system) with EBD (electronic brakeforce distribution); all 4 disc brakes and brake assist come as standard on all variants. 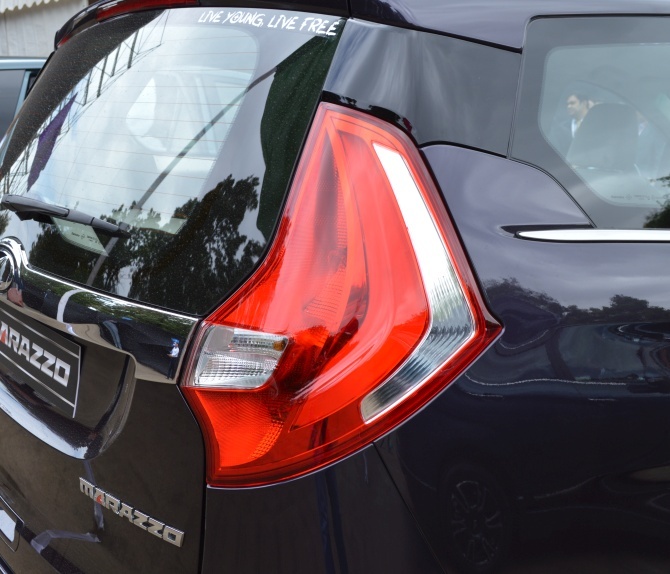 Mahindra has smartly slotted the Marazzo in between Toyota Innova and Maruti Suzuki Ertiga. Toyota currently rules this segment with Innova and with the launch of the new Toyota Innova Crysta, its market share has become even stronger. Innova is offered in both petrol and diesel variants and is backed with low maintenance costs and Toyota's reliable service. Maruti Suzuki Ertiga offers good ride quality, features and comfort at very affordable price point. 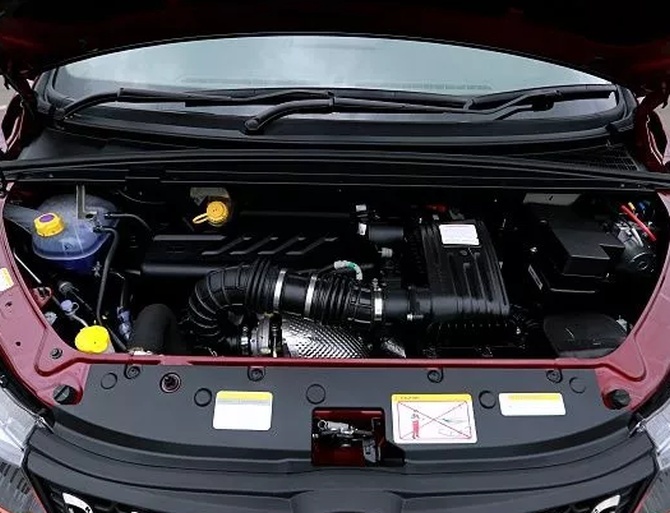 The diesel power unit of Ertiga is not as powerful or performance oriented as others in the segment but it is highly fuel-efficient while compromising on performance. 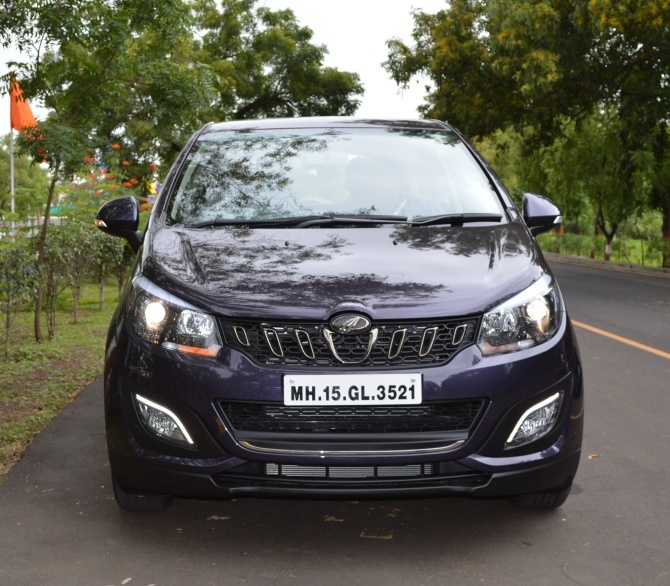 The Mahindra Marazzo is a budget-oriented MPV with unique design, good styling that sets it apart from its counterparts, and has enough punch for day-to-day driving requirement. It is comfortable, spacious, easy-to-maneuver and does everything you would expect from an MPV. 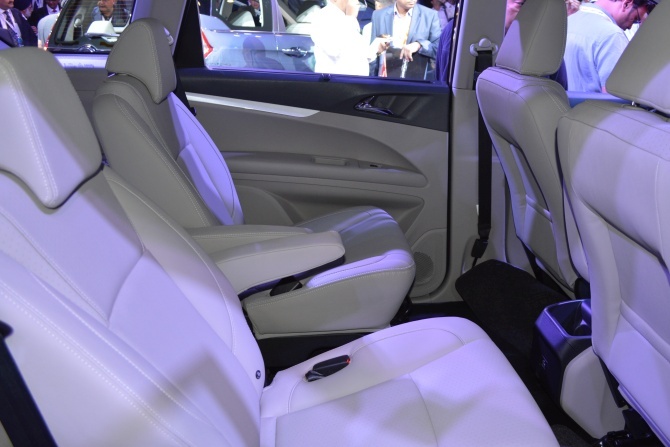 The Toyota Innova Crysta is the benchmark in this segment. But it is also costlier by around Rs 500,000-600,000. So if its price is a deterrent, then the Mahindra Marazzo is the one for you.